I recently stumbled across a great blog post by a Melbourne based, freelance cartoonist, Gavin Aung Than, who was very excited because one of his comics had been turned into a short film by a university graduate from the UK. Read all about it and check below for the meaning of some vocabulary and expressions (in bold type) that you may not know. The comic, which to date has garnered well over 4000 Facebook ‘likes’, was inspired by an emotive poem called, Around The Corner, written by the American poet, Charles Hanson Towne (1877-1949). The theme of the poem is something that I’m sure most of us can relate to. When we are young we make good friends and really nurture those friendships. However, as we grow older we allow life to get in the way. We concentrate on our studies, our work and our family life and we find ourselves neglecting those precious friendships of our youth. Although we often think about and plan to contact friends we have lost touch with, many of us never do and, sadly, some of us leave it so late that we will never actually get the chance to. 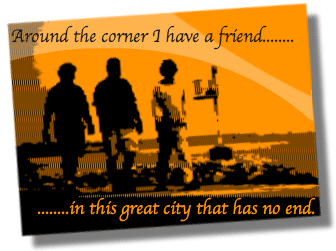 The message of the poem is to not let anything get in the way of those cherished friendships. You can read the poem below, then find out what inspired the young film maker to create his short film based on Gavin Aung Thans comic strip. Before we read the poem, though, lets first explore the different meanings of the expression around the corner as it will really help you to understand the message of the poem and video below. a short period of time away (very soon, imminent) – OK, so you’re finding it difficult to get a job, but try to stay positive, you never know what opportunities lie around the corner. Gavin Aung Than used the poem, Around the Corner, as inspiration for one of his comics that he published on his website, ZenPencils.com, in November, 2012. Gavin created Zen Pencils due to the boredom of his job as a corporate graphic designer and a desire to express his passion for illustration and cartooning. At my old job, when my boss wasn’t looking, I would waste time reading Wikipedia pages, mainly biographies about people whose lives were a lot more interesting than mine. Their stories and quotes eventually inspired me to leave my job to focus on what I really wanted to do. The idea of taking these inspiring quotes, combining them with my love of drawing and sharing them with others led to the creation of Zen Pencils. Poets to Presidents, comedians to colonels – anyone who inspires me, challenges my way of thinking, wakes me up or just makes me laugh. Sahel Takal, who studied Film & TV at Anglia Ruskin University, in Cambridge, UK, asked Gavin’s permission to adapt the comic for a short film which he is now entering into the 2013 London Sundance Film Festival Short Film Competition. The main theme of the competition was time, when I saw this comic I immediately fell in love with the simplicity of it. I could not help but to visualise all the images in my head. It showed time in different ways: as a kid you have all the time in the world to hang around with your friends, but as adults you have almost no time, because of work and family. This inspired me a lot and I really wanted to adapt this into a film. I wanted to bring the still images to life and tell the story through a different art form. Gavin was absolutely thrilled with Sahels work as he had often pictured what some of his comics would look like if they were turned into films. Discover something by chance; meet someone by chance. times but not never permanently employed by anyone. Identify with; feel sympathy with. Care for, help or encourage the development of. Failing to to care for properly. Something of great value not to be wasted or treated carelessly. Stop corresponding or communicating with. A view of or attitude toward a situation or event; an opinion. filled with the urge or ability to do or feel something – especially creatively. Is Facebook Killing Your Real World Relationships? I love this poem and the video really bring it to the real life. Now I feel I must to call my friends more. Glad you like it, Christine! It certainly made me want to get in touch with some of my old friends, too. 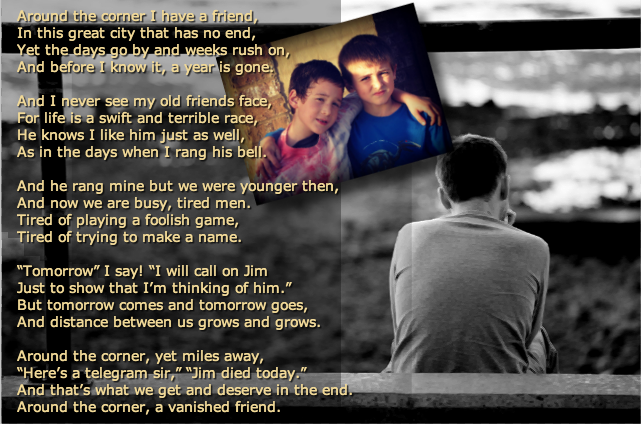 This is a beautiful poem and makes me miss my friends. I like learning English poetry. It helps me understand the culture much.